Find the cheapest PHL parking rates by using the search bar below. Where can I park for Philadelphia Airport short term parking? Every parking garage at Philadelphia Airport offers hourly options for short term parking. Each PHL parking garage is located adjacent to the corresponding terminal and is the most ideal option for dropping off and picking up passengers. Pedestrian bridges connect each parking garage to a terminal, making it easily accessible. What are the rates for Philadelphia Airport short term parking? Short term Philadelphia Airport parking has the same hourly rate at all parking garages. The first 30 minutes costs $4, and each additional 30 minutes after costs $2. After 4 hours, the daily rate of $40 is charged. Does Philadelphia Airport offer free parking? Yes, Philadelphia Airport parking offers a free cell phone waiting lot for dropping off and picking up passengers. The lot is accessible from both I-95 and Route 291, features space for 150 vehicles, and is less than a one-minute drive to the baggage claim areas. The maximum wait time for this lot is 60 minutes, and drivers must remain with their vehicles at all times. 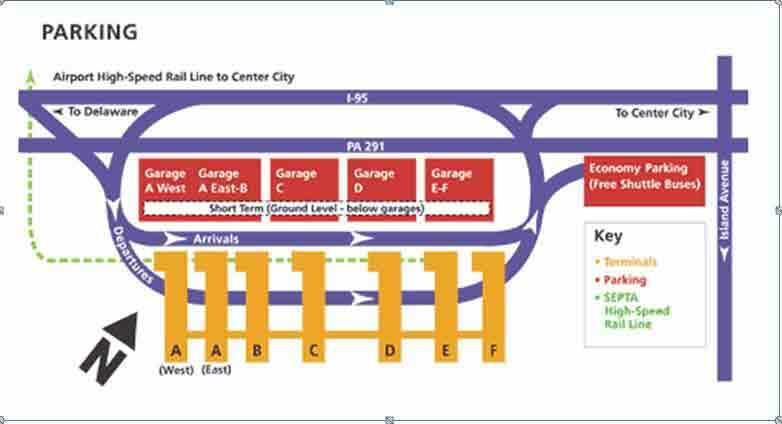 Where can I park for Philadelphia Airport long term parking? Philadelphia airport long term parking is available at all terminal parking garages and at the economy lot. The terminal parking garages connect to each terminal through a covered pedestrian walk way, making it the closest PHL parking option. Offsite Philadelphia Airport parking is also available at the cheapest daily rates. What are the rates for Philadelphia Airport long term parking? PHL parking rates are $11 per day at the economy lot, $24 per day at the daily parking garages, and $40 per day at the hourly parking garages. Offsite Philadelphia international airport parking rates are about $6-$8 per day, making these lots the cheapest long term parking option. Are shuttles offered for Philadelphia Airport long term parking? Yes, free shuttles are offered for long term Philadelphia airport parking. The free shuttles run every 15-25 minutes, and are round trip. Most shuttles operate 24 hours a day, 7 days a week. Can Philadelphia Airport parking be reserved? Yes! Just visit way.com to reserve your PHL parking space today! Where can I find Philadelphia Airport discounts and coupons? You can find cheap Philadelphia parking and deals through websites and apps like Way.com, Groupon, RetailMeNot, and Ebates. You can also find up to date news and events on the Official Philadelphia Airport Parking page. Where is the Philadelphia Airport located? Philadelphia Airport is located at 8000 Essington Avenue, Philadelphia, PA – 19153. They can be contacted by calling (215) – 937 – 6937.